OFM started broadcasting on the 1st of July 1985. Since then the station has established itself as the media power house of central South Africa. 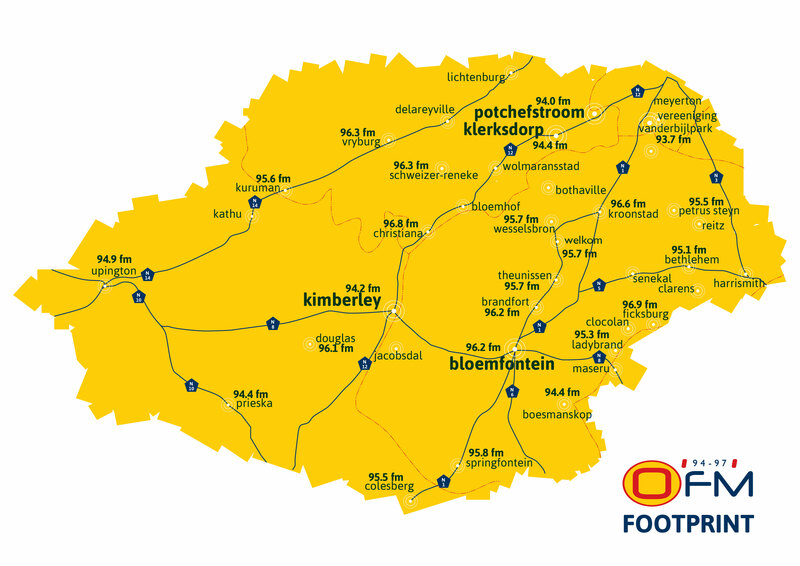 Today the station broadcasts in English and Afrikaans across four provinces – Free State, Northern Cape, North West and Southern Gauteng. As one of the leading companies in utilising new technology as part of their daily functioning and interaction, OFM has delivered results for advertisers and at the same time established itself in the hearts and minds of listeners across central South Africa. The station boasts with more than half a million listeners in the LSM 7 – 10, age 25 – 49 target audience. Our listeners are innovators; enjoy leisure activities, sport and the outdoors. They are brand loyal and not price sensitive. The station understands that music plays an integral part in gaining or losing an audience. The music format of the station is adult contemporary, interspersed with news and views from the station’s team of on-air personalities. Research is conducted to determine the type of music listeners want to hear and the playlist is adapted accordingly. The community is strongly reflected with various successful charity campaigns. Our news team ranks under the top news departments in the commercial market and has won numerous awards for their professional and insightful journalism. Over the past few years OFM has been at the forefront of sports sponsorship in South Africa. The media sponsorship of the Toyota Free State Cheetahs, Leopards and the Griffons has ensured that OFM has enjoys national and international television exposure almost every single weekend. Other major station events includes the Shoprite Checkers OFM Chip 4 Charity, OFM is also a main sponsor of the Aardklop Arts Festival in Potchefstroom, media sponsor of these annual festivals which include: Gariep Arts Festival in Kimberley, Clarens Craft Beer Festival, Bloemskou in Bloemfontein and the Free State Arts Festival in Bloemfontein.